Sources for reconstructing a colonial life can be intermittent and frustrating. The personal touch is so often missing in the "factual" records we employ. How seldom we encounter the expressed feelings and thoughts of an ancestor. When we do, the thrill may quickly raise more questions than answers. Case in point ― reasonably exhaustive research rather than a solved research problem. A prominent citizen in the London District of Upper Canada, Roswell Mount (ca.1797-1834) shockingly excoriated his wife Eliza in his will. He lived in Caradoc township across the Thames River from Delaware township and a fledgling village. His premature death on 19 January 1834 was attributed to overwork and family stress. 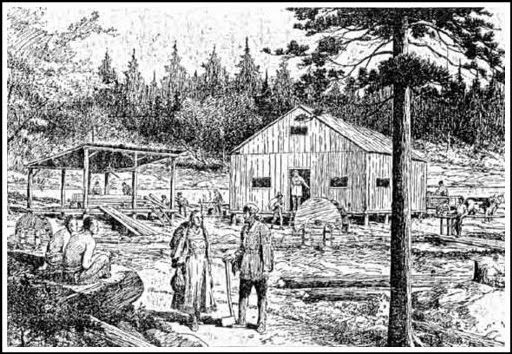 An early surveyor in the district, an agent for the Crown lands department, and member of the legislative assembly for his home riding of Middlesex, Roswell had overextended himself physically and financially in re-settling a flood of recent immigrants. Clearly a hard worker, the only local issue seemed to be controversy over his township surveys until at least 1856. Roswell's will was written and witnessed the day before he died in the town of York where the legislature was sitting. It was at the peak of a cholera epidemic and I wonder if the disease did him in. St. James Church in York was the setting for his solemn funeral and burial (along with a conjunctive service for Chief Justice William Campbell). Newspaper reports do not mention if the widow was present, although his young son attended. But why the rancour against Eliza? ... Because she, the wicked thing, had run away from him. "Whereas my wife Elizabeth or Eliza has by her infidelity to my bed embittered a great part of my life, and caused me much unhappiness both on my own account and that of my dear and innocent children, and whereas not being willing to abandon and leave her destitute I did provide for her a suitable residence, and was willing and desirous notwithstanding her past unhappy and wicked conduct have allowed her a decent and respectable maintenance according to her degree separate and apart from me, and whereas she without any provocation from me departed from such residence and now lives with another, in open defiance of common propriety and decency, and whereas I have reason to be well assured that the second son born of the said Elizabeth or Eliza my said wife was conceived in adultery and is not my child, and whereas I am desirous that my dear children Charles and Eliza Amelia shall as much as possible be protected from the consequences of bad conduct and example of their mother, I therefore bequeathe to my said wife Elizabeth or Eliza my forgiveness and no more." Eliza had not run far. The object of her affections was a nearby man of considerable means: Simeon Bullen of Delaware. A man about twenty-five years her senior. How did the neighbourhood ― a very small population at the time ― react? Shunning? Or sympathy? Was Eliza's flight motivated by mad passion or desperate consolation? Did Roswell's financial pressures turn him into a domestic tyrant difficult to live with? Was Eliza a wanton woman, or simply neglected and vulnerable? Was the public scandal of adultery less onerous to bear than her marriage? Roswell was the son of Moses Mount and Jane Burtch, Loyalists who came to the Grand River area. Roswell's wife Eliza was the daughter of Gideon Tiffany who came to Upper Canada from America in 1794 as the King's Printer. Eliza left her husband well before the execution of his will. Yes, by then she had already borne Bullen a son named after her father. Her two Mount children were then in schools at York. The "bastardous" son Gideon Bullen was baptized several years after his mother remarried. The day before their wedding, Simeon paid his bride £300 to buy her village lot in Delaware; perhaps it was a gesture to ensure her future security. Several Tiffany-Bullen-Mount transactions were registered on the same day. It seems the unusual circumstances preceding the belated marriage did not cause Eliza’s family to hold Bullen in disregard. Her father Gideon Tiffany was also a leading community figure. Property sales and exchanges continued among the Bullen and Tiffany families. Eliza and Simeon went on to have additional children and were ultimately buried together. The few later records of Roswell and Eliza's two Mount children — Charles (born 1821) and Elizabeth Amelia (born 1827) — do not demonstrate any particular "protection from the consequences" of their mother's actions. They were perhaps even mentored by Bullen. 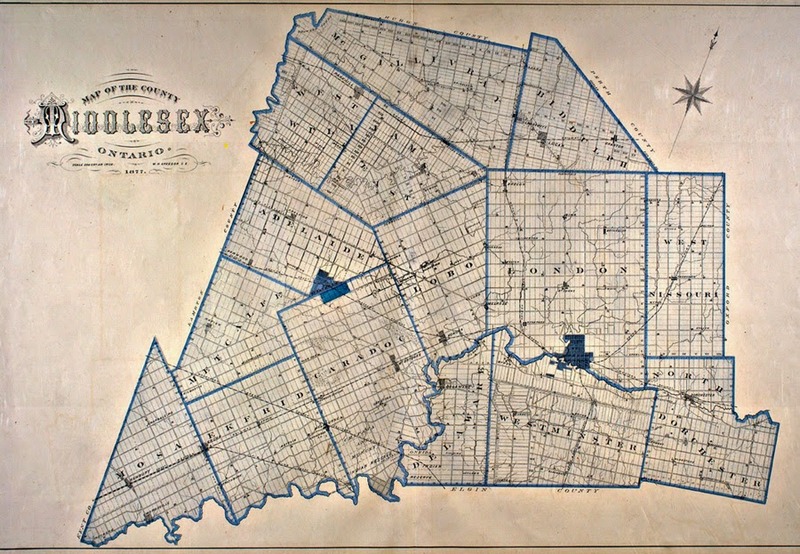 Elizabeth Amelia married Orlo M. Mabee about 1847 and lived in Middlesex County until at least 1871. Charles Mount disappeared from sight after reaching the age of majority when he signed over to Simeon Bullen his claim to his father's remaining properties. Roswell's bones might have been spinning if he knew that. The son Gideon Bullen apparently vanished without being recorded in the 1851 and later census returns. The 1851 returns for London, capital of the district, are unfortunately missing; Delaware returns may be incomplete as men certainly living there at the time are also "absent." Eliza Bullen lost her father Gideon Tiffany in August 1854. His modest estate was valued at £10. In July 1855 the administration was granted to Frederick Tiffany of Delaware, one of his known sons. Another son, Dean Tiffany, was one of the sureties. Somewhat murky circumstances followed. About the same time, Gideon D. Bullen of Delaware tried to claim administration as a creditor, saying the estate was worth £50 and he was owed £10. To substantiate his claim, he said — inexplicably — the deceased had "no next of kin within [the] province" but only a brother and sister in the U.S.A. (which was hogswallop: for one thing, deceased's daughter Eliza and two sons were demonstrably nearby). However, Gideon "D" withdrew his petition at the end of December 1855. The paucity of preserved papers in estate files at that time precludes further enlightenment. Then Eliza's husband Simeon Bullen died in April 1855. Though a fairly wealthy man, Simeon had failed to make a will that might have told us more about his family and heirs. Widow Eliza duly became administrator of his £1,200 estate on 11 May 1855. Gideon D. Bullen of Caradoc along with Ira Allan ensured her bond with the court. A note on one document: "The said Gideon Bullen further saieth that the letter 'D' is only an [initial] letter in his name." Extended (negative) searches for further information leave peripheral questions still unanswered: Who is Gideon D. Bullen? Is he the illegitimate son distinguishing himself from an older Gideon Bullen who married in 1844? The older man, too, does not appear in 1851 and subsequent census returns. What happened to Charles Mount and his half-brother Gideon Bullen? Would descendants ever know who precipitated the marital crisis? Does it matter? Roswell left us an emotional record that tells part of a story. How much can we infer from existing sources to "balance" Eliza's part in it? Family historians struggle in cases like this to present a narrative as realistic as possible, including the unanswered questions. This is an updated version of "Roswell Mount: The Untold Story," in Ontario Genealogical Society Families, Vol. 45, No 3 (August 2006). Middlesex County Copybook of Deeds, Vol. E, memorial no. 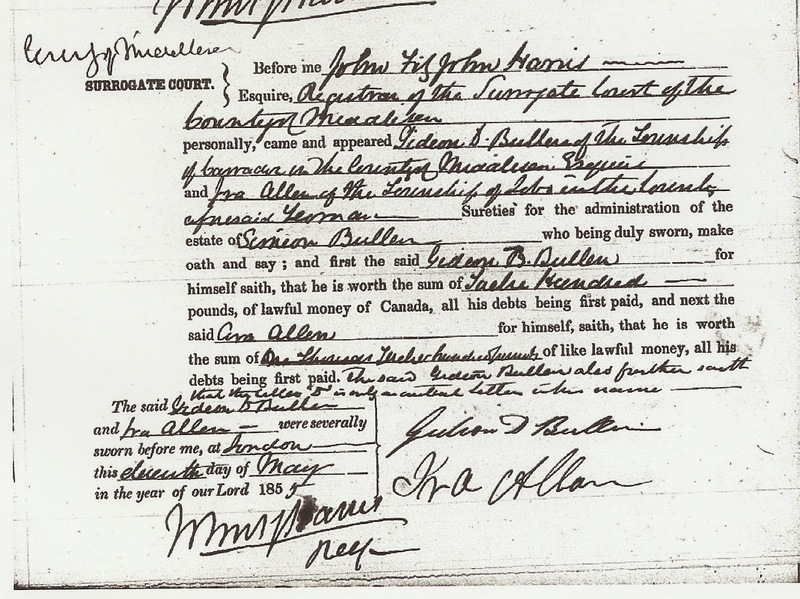 2096, will of Roswell Mount, 18 January 1834; Archives of Ontario (AO) microfilm GS 204. Canadian Emigrant (Sandwich, Upper Canada), 1 February 1834. Wendy Cameron, "Roswell Mount," Vol. VI (1821-1835), Dictionary of Canadian Biography (www.biographi.ca/en/mount_roswell_6E.html : accessed 10 June 2006). "Disputed Titles to Land," London Free Press (London, Canada West), 8 May 1856, p. 2, c 6. Canadian Correspondent (York, Upper Canada), 25 January 1834. Middlesex County Copybook, Vol. E, memorial no. 2096, will of Roswell Mount. Middlesex County Copybook, Vol. E, memorial no. 2461, Oliver Tiffany to Eliza Mount, 5 November 1834; AO, GS 204. Eliza is identified as the niece of Dr. Oliver Tiffany, brother of Gideon Tiffany. For Gideon Tiffany, see also Dictionary of Canadian Biography (http://www.biographi.ca/en/bio/tiffany_gideon_8E.html). Middlesex County Copybook, Vol. E, memorial no. 2096, will of Roswell Mount. Gideon Bullen is identified in Roswell's will as Eliza's son. The Bullen "Trees" I see on Ancestry.com have missed this child. So has the 1901 tome The Tiffanys of America (https://archive-org/stream/tiffanysofamerica00tiff : accessed 26 October 2013), p. 43 (person no. 553 is Eliza Tiffany married to Simeon Bullen). Letter Mahlon Burwell to Peter Robinson, 13 March 1834, RG 1-2-4, Correspondence and memoranda relating to lands administration received by the Surveyor General, p. 11724; AO, MS 7533. Anglican register (Delaware, Ekfrid, and Caradoc Townships), Baptisms-Marriages-Burials, 1834-1851, baptism April 1838, Gideon Bullen, "bastardous" son of Simeon and Eliza Bullen. Bullen-Mount marriage 24 December 1834; AO, MS 881, reel 5, item 37. Middlesex County Copybook E: memorial no. 2461 Oliver Tiffany to Eliza Mount, 3 November 1834; memorial no. 2462 Oliver Tiffany to Simeon Bullen, 1 December 1829; memorial no. 2464 Eliza Mount to Simeon Bullen, 23 December 1834; AO, GS 204. The three transactions were all registered on the same day in early 1835. Christ Church Anglican cemetery (Delaware Township); London-Middlesex Branch, Ontario Genealogical Society transcription. St. Philip’s (Etobicoke, Ontario) parish registers, Baptisms 1831-1845, Mount baptisms 11 September 1833; Anglican Diocese of Toronto Archives. 1871 Census Ontario, District 9, East Riding Middlesex, subdistrict b, North Dorchester Township, division 2, p. 26, Orlow Mabee household; Library and Archives Canada (LAC) microfilm C-9904. Only one of the anomalies in this research is a Charles Mount age 18 living in this household; I believe he is their son with his middle name inadvertently inserted as surname. Lindsay S. Reeks in Ontario Loyalist Ancestors (p. 87) says Orlo and Eliza married on 9 March 1847 in London but this is not confirmed. Middlesex County Copybook N, memorial no. 6193, Charles Mount "of Delaware" to Simeon Bullen, 20 March 1843; AO, GS 212. Middlesex County Surrogate Court, estate file no. 56, Gideon Tiffany; AO, GS1-9. Middlesex Surrogate Court, estate file no. 56, petition affidavit of Gideon D. Bullen, 13 July 1855; AO, GS1-9. Middlesex County Surrogate Court, estate file no. 14, Simeon Bullen; AO, GS1-9. Anglican register (Delaware, Ekfrid, Caradoc), Bullen-Brigham marriage, 1844; AO, MS 881, reel 5, item 37. 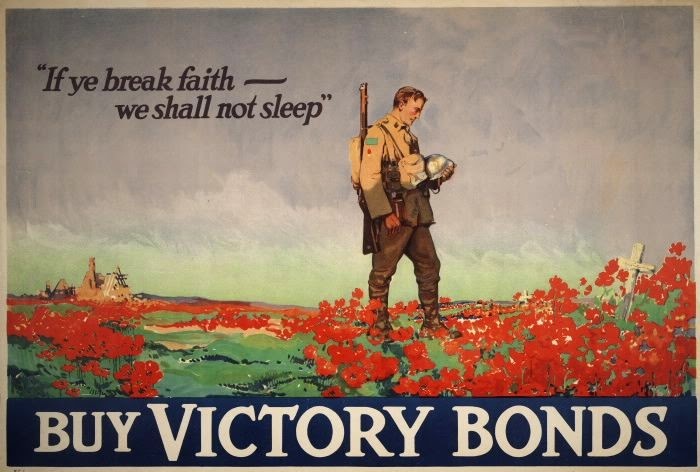 Canada went to war on the fourth of August 1914. 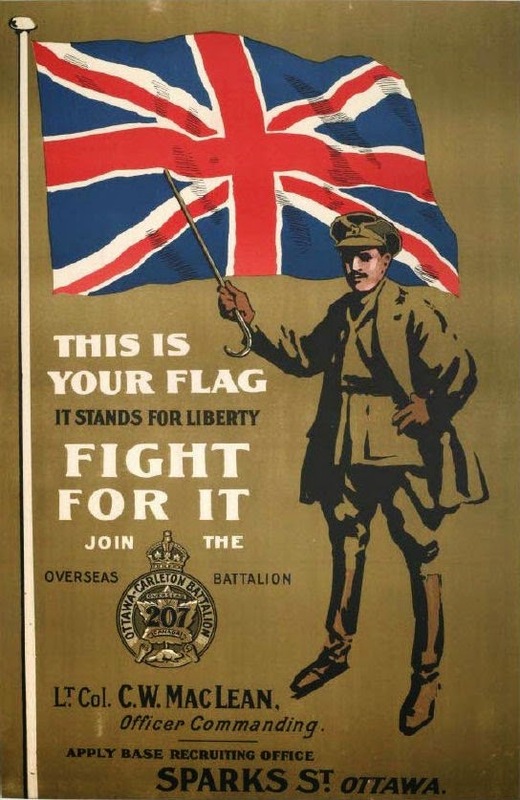 When Great Britain declared war on Germany on that day, Canada was automatically included as a Dominion of the British Empire. Immediately, Canada offered to send military support; the Canadian Expeditionary Force was formed. Canada ― then a nation of under eight million people ― sent 620,000 enlistments over the duration. Our country lost 60,000 during the war, not including those who died later of wounds. To quote historian Tim Cook in Macleans ("Could we do it again?" 11 August 2014), "If you put that death toll into the equivalent of today's population, it comes out to something like 250,000 dead in four years." Our Second World War losses were a comparative fraction. More Canadian soldiers died in the First World War trenches than in all other wars we participated in. Let us not forget the sacrifices!